What does unemployment taste like? : As we’ve written before, it’s not all about visualization; you can use every one of your senses to help understand data. In Europe, a group called Data Cuisine is trying to convey local data with local food. The group represented a drop in science funding in Spain with two almond cakes, one based on the funding level in 2005 (prepared with scientific gadgets such as a microwave) and one on the level in 2013 (no gadgets). The group also tested whether unemployment data makes bread harder to swallow. 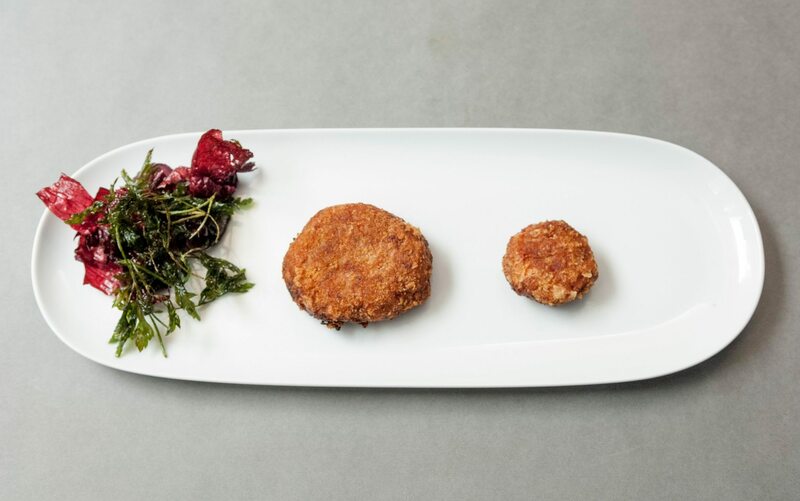 In the more simple dish shown above, Pilar Talavera used leftovers to visualize the number of homeless people in Barcelona. She varied the amount of each ingredient to show summer (more homeless people on the streets) and winter (fewer of them). Iraqi casualties: To convey the chaos currently taking hold of Iraq, Alexandre Léchenet at Le Monde used United Nations data showing that the number of civilian casualties rose dramatically in June. 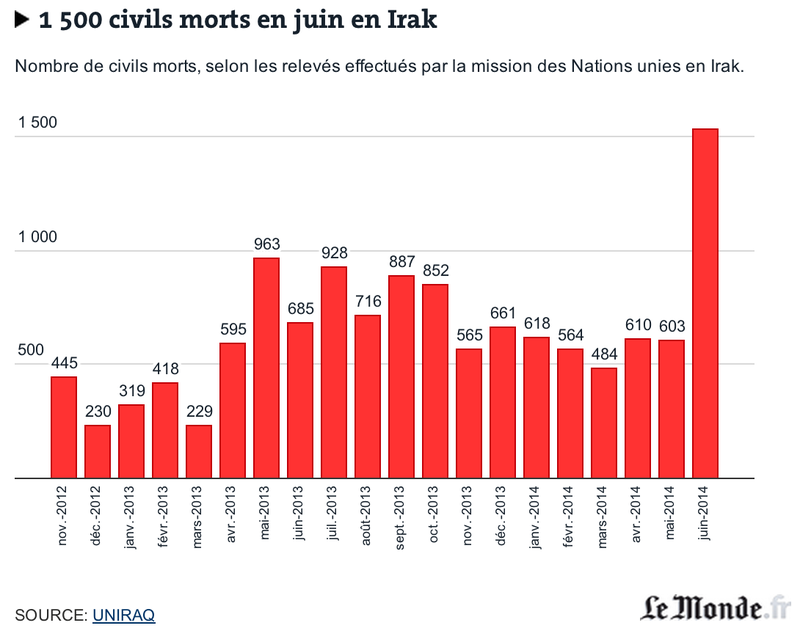 According to Léchenet, who also visualizes data from a less official source, Iraq Body Count, the death toll is now at its highest level since 2008. The curse of the fourth season? : Graph TV creates these great little interactives to chart the popularity of each and every episode of a show using ratings data from IMDb (ratings as in grades, not viewers). 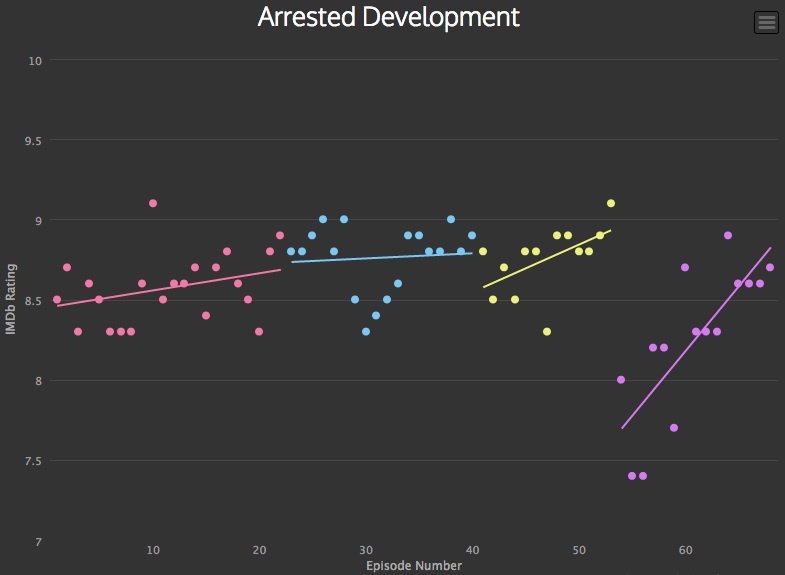 Seeing as “Community” is back for a much-anticipated sixth season, Ampp3d used those charts to look at how previous seasons have compared. It turns out that the fourth season of “Community,” like the fourth season of “Arrested Development,” shown above, got off to a bad start with viewers. But both shows managed to bounce back in ratings for later episodes. The $1,281 dress: In 1939, B.F. Timmons, a sociology professor at the University of Illinois, published a study called “The Cost of Weddings” based on 154 couples. Seventy-four years later, the wedding-planning site The Knot surveyed 13,000 brides to ask about the cost of their big day. Quartz used the two data sets to see how American weddings have gone from expensive to über-expensive. Extinction rates up to 1,000 times higher than nature would predict: ProPublica has created this incredibly detailed interactive based on data from the International Union for Conservation of Nature’s Red List of Threatened Species (by far the most comprehensive source there is). First, you read that 13 percent of birds species are headed toward extinction, as are 22 percent of reptiles, 25 percent of mammals and 41 percent of amphibians. Next, you scroll down to discover exactly which animals are at risk.